Update: It turns out that what I observed was the Greek changing of the guard as happens at other governmental buildings. Soldiers, dressed in classic uniforms change station and some are positioned at the tomb of the Unknown Soldier. 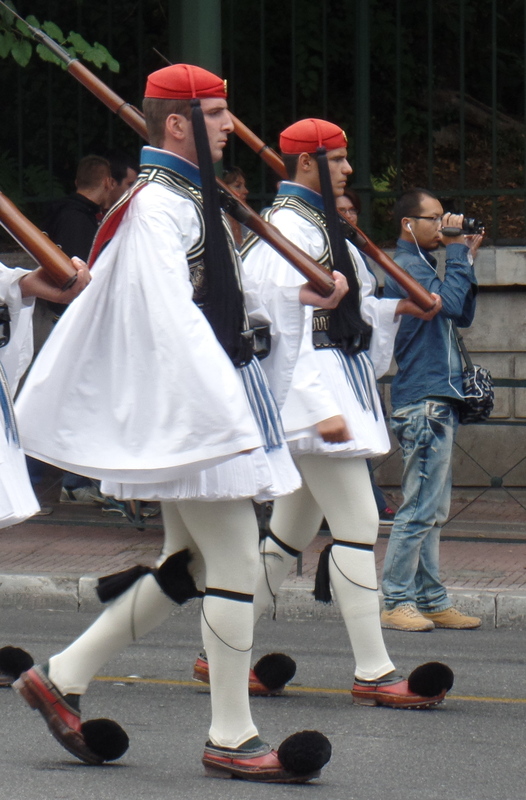 As I was wandering around Athens yesterday, I noticed a strong military presence down one of the streets. There were riot control buses and many heavily armed personnel. Curious, I wandered down the street to see what was up. One of the major thoroughfares was entirely cordoned off. Considering the recent economic crises in Greece, I wondered if it was a protest of some sort, but it ended up to be a Greek military procession of cadets, I think, marching from their barracks to the Greek Parliament building. Though an ardent pacifist, I couldn’t help but be moved by the scene and the pride of these young men. Plus, the outfits are amazing!